There are three races in UniWar: Khraleans, Sapiens and Titans. Each race has 8 units that vary in type and abilities. There are strengths and weaknesses with each race that play a role in the game. Learn each race and its units to build a strategy. There are four unit types: Ground Light, Ground Heavy, Aerial and Aquatic. Their attributes include the cost, mobility, attack range, attack strength against each unit type, defense strength and vision. Some units have special abilities such as using an EMP, teleporting or burying underground. Other units also have abilities such as being able to capture a base, being able to attack after a move, and being able to occupy certain terrain. You can view the attributes of the units in the Info screen or while creating units. There are nine terrain types: Plain, Base, Forest, Mountain, Swamp, Desert, Water, Harbor and Medical. Each terrain requires a number of mobility points in order for the unit to move to it. Some terrain cannot be occupied or crossed by certain types of units. Terrain can affect the attack and defense points of occupying units. 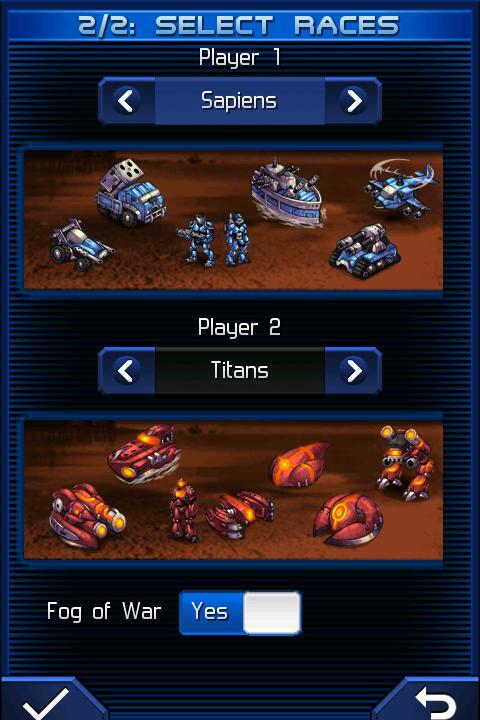 The Base and Harbor terrain can be captured to create units, but only Bases generate credits. The Medical terrain allows an occupying unit to repair three times their normal amount in one turn. You can view the change in attack and defense and the cost of mobility for every terrain by each unit in the Info screen. Use the terrain to boost your unit's attack and defense strength during battle.